Wedding cake cupcakes for two, for your wedding anniversary! Not to be a buzzkill, but someone looked me right in the face and told me a wedding cake for two is a dumb idea. She clearly has not drank the ‘dessert for two’ koolaid and realized how cool it is to make miniature desserts. (Or, she can resist leftover cookies and cupcakes better than I can, who knows? Maybe a pan of brownies doesn’t whisper to her, begging her to eat them the way they do to me). The point is: the criticism stuck with me for a long time. Sometimes, it’s a good thing when someone undermines your passion; it makes you re-evaluate. I immediately began running through my elevator pitch of what exactly ‘dessert for two’ is, and what it means to me. After some small tweaks to my verbiage, and I add more emphasis on ‘small batch’ and ‘no leftovers’ and ‘date night,’ because that’s what dessert for two means to me. It’s a way to enjoy desserts without tons of leftovers (a new dessert everyday, if you wish! ), it’s a fun way to bake (just 1 egg and small scoops of flour! ), and it’s the perfect cap on date night. All good things, you know? Would you make wedding cake cupcakes? So, what I want to know is: are you with me? Would you make a mini wedding cake on your anniversary? 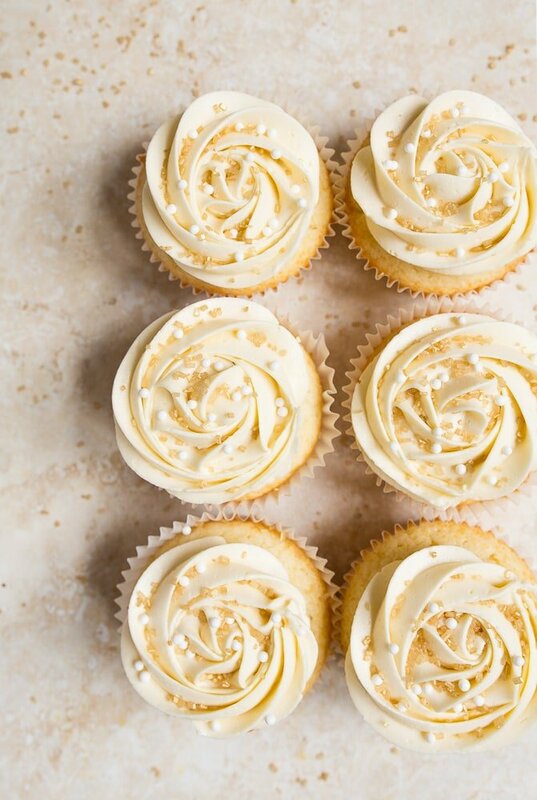 Would you make wedding cake cupcakes on your wedding anniversary, or on a random Tuesday just because you really love almond-scented cupcakes with buttercream roses and sugar pearls? I know who’s on my team. Ina is on my team. She makes a mini wedding cake for Jeffrey on their anniversary, and since they are #relationshipgoals, we best do the same. So, what exactly is wedding cake flavor? 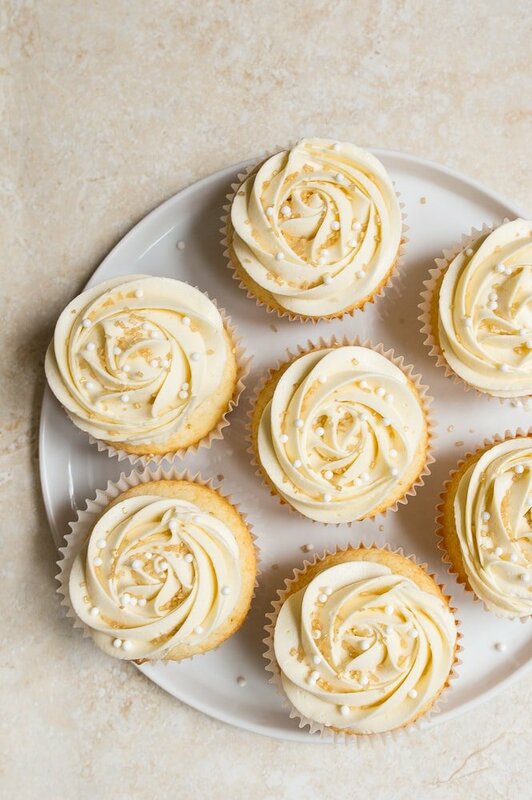 Wedding cake cupcakes: they’re light and fluffy because they’re made with only egg whites. They’re rich because they’re made with sour cream. They’re delicately almond-scented, because that is what gives wedding cake it’s traditional flavor. The buttercream on top is perfection. Sally teaches us how to make buttercream roses, and it’s the best tutorial. You won’t believe how freaking easy they are! Plus, they’re made with the one piping tip we all have in our drawer. This recipe makes just 4 cupcakes, but I’m showing more than 4 here in the photos because I have several batches laying around. The recipe is easily doubled, too! Wedding cake cupcakes, small batch style. First, make the cupcakes: In a medium bowl, beat with an electric mixer the butter, sugar and almond extract. Beat until light and fluffy, at least 30 seconds. To make the frosting: beat the butter in a small bowl with an electric mixer until fluffy, about 1 minute. Add the powdered sugar, 1 tablespoon of the cream and the almond extract. Beat until very light and fluffy, about 1-2 minutes. Add more cream, if necessary. Scrape the frosting into a piping bag fitting with a star tip (I used a Wilton 1M). To make the rose shape, make a circle starting in the center of the cupcake and work your way out. hi, yes, i’m with you and would definitely make gorgeous mini almond-scented cakes that are probably too extra for a random tuesday but i want them anyways. also, i need to get on that buttercream piping train asap because i’ve been loving how all the buttercream piping has looked on social media recently! What better way to say “I’d marry you again in a heartbeat” then wedding cupcakes on a random Tuesday!!!! Love this and am loving all your recipes! ???? I am SO with you. I made the chocolate rice crispies and the gooey chai bars from your cookbook this weekend.. LOVE. I made the brioche buns too and can’t wait to have them with burgers tonight! definitely want to make the mini wedding cake too because it’s just too cute to resist! “Desserts for two is dumb”….say what?! Made a full batch of cookies yesterday and had to hide the extras from myself–I hate that!! Many times I bake your cupcakes for two in mini cupcake liners but for baking in a 6-in pan, do all your cupcake recipes need to be doubled? Great minds think alike!! I’ve got a wedding snack cake coming up on the blog. Who needs an invitation when you’ve got these yummy treats in the kitchen, love it! My five-year-old is fascinated by our wedding. (“So who was looking after me? What kind of cake did you eat? Is there any left?” It was seven years before he was born and the strawberry-filled cake is long gone.) If I made these for our family (of now four!) to enjoy every year on our anniversary, the kids would be so happy to FINALLY be included! That poor, confused, person you were talking to. I hope she got home safely. Wedding cakes for two is so perfectly romantic! I love the idea (like all your others)! I’ll whip these up in June. Thanks! I’m totally with you. Before your blog I’d make a couple dozen cookies or a 9″ cake and put the leftovers in the freezer. It was OK but not as good as freshly made cookies or cake, so these small recipes are very helpful for small households. That said, nothing works for everyone and this person you mentioned is entitled to her opinion. However, if she can only equate “this isn’t something I would do” with “this is a dumb idea”; well, that says more about her than about you. As you said, she made you re-evaluate your passion, so good came out of it after all. I am happily eating one of your brownies as I write this! I am totally with you (and you are a genius)! These cupcakes are perfect. They are stunningly simple and elegant, like a good wedding cake usually is. Now I will have to make wedding cake cupcakes or a mini wedding cake for my next anniversary! I think dessert for two is a perfect date night activity. You get to make them together. Then you get to eat them together. So much fun! The recipe looks amazing and the rose is the icing on the cake. Hehe. Beautiful cupcakes. Totally with you on the cake! I didn’t have a wedding cake so maybe now is the time to start! As a side note, could you maybe use another phrase besides “drank the koolaid” that doesn’t invoke a literal massacre? Maybe “jumped on the bandwagon” or “joined the club”. The vast majority of people today have no idea about the Jonesboro incident. The phrase “drank the Koolaid” is used in every single sub-community in American culture, particularly the military; at this point, it just means buying into whatever ‘the man’ is selling. Don’t allow yourself to be afraid of words. – From your friendly neighborhood English professor. For someone like me, who does not like being the center of attention and does not plan on having a large wedding, small batch wedding cake is a brilliant idea. Why the hell would I want to spend a ridiculous amount of money on a “standard” sized wedding cake, most of which will get thrown out, when I can bake just enough for my immediate family? But for the person who made the “dumb idea” observation, I suppose they see a wedding as an opportunity to showboat for hundreds of guests. In that case, small batch cupcakes would not be the best plan. And I hope their future divorce goes smoothly. Wow, what a strange reaction. I think cake, of any size or flavor, is always a good idea! 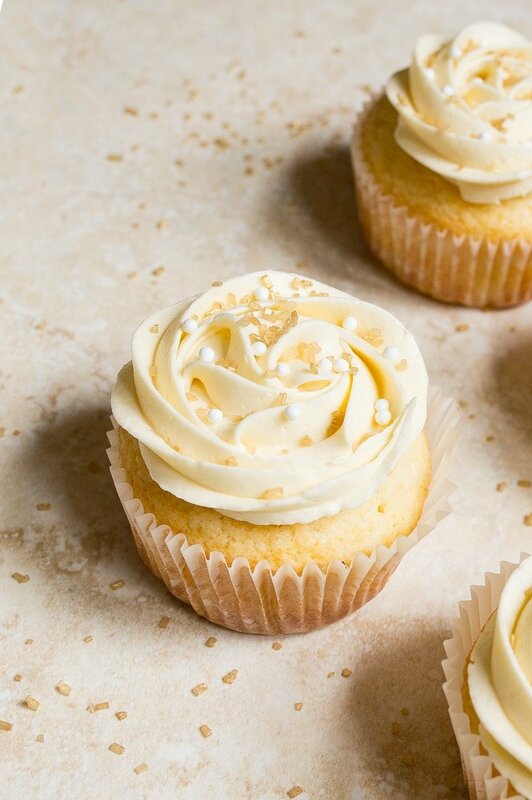 These, in particular, look so similar to the cupcakes we served at our wedding and I can’t wait to whip them up in July. Thanks for sharing! These look like pure bliss! When I got married my sister made your wedding cake for two for me. It was wonderful and perfect! Our guests had cupcakes and we had an adorable, perfectly sharable cake. My anniversary is on June 20th and I like knowing that I can easily recreate the cake we had at our wedding. I think that is pretty special! Yes! I am totally with you. My husband has juvenile diabetes so desserts are a real treat & we only eat one serving…or just 1/2 a serving…on special occasions. So yes, I would definitely do this for an anniversary. I religiously follow your blog, save your recipes & try them often. I love using them for a girlfriend lunch or brunch as well because I don’t want leftover sweets & breads laying around. If anything, I’d love to see more recipes from every food group; main dishes, sides, pasta dishes, ect. I cook for one or two people every day & love being able to have variety & no food waste. hey girl- love the cupcakes ! so cool! Love, love your recipes! Do you know why when I print the recipes the font for the title, times, and subheadings come out in a crazy font that I cannot read and have to write on the recipe what it is for. This happens on my little home printer and the large laser printer at work. Just wondering. My mom had the audacity to say something similar to me when I was making one of your recipes. “Why go to the trouble of baking if you’re only going to make enough for two people?”. Uh, I don’t know mom. Maybe because I like dessert, have no self control and don’t want to get fat! You have to read that in a teenager type tone for the full affect. I am sooo with you, Christina! I come from a family of sweet dislikers. That’s right. My family is made up of weirdos. So when I bake, I, the sweet tooth extraordinaire, devour the whole thing. I need your recipes in my life. And wedding cake cupcakes for two (or one, in my case?!). Oh yes. I’m very happily single, but I can’t think of any time in my life I would turn down wedding cake! Plus, these would look just DARLING on a cake plate for a pretty ladies’ tea! Or just a pretty lady’s tea…as in just one lady. As in me. By myself. Eating ALL four. I’m hungry looking at these! Fab! Could these be made into mini cupcakes? bake time? how many would one recipe make? Have you doubled the recipe? thanks…. I’ve only made the recipe the way you see written, but I did mention in the post that I doubled it successfully. As for changing the size of the cupcakes, it will decrease the baking time, but I can’t be sure exactly how much. It looks like a work of art, it pays to eat, it has two uses: it graces and satisfies the palate of the guests, beautiful indeed. Christina, your recipes are a match for so many of us. Thank you. The idea I wish to add is: wouldn’t these wedding cupcakes make a sweet gift for a non baking friend’s anniversary? Imagination is all it takes. Although i like your idea of cupcakes for 2. I really love the way these cupcakes look. I would love to make them for a Baby Shower. Can you please give me the recipe to bake these and frost them for a batch of 24. Sorry, but I only make small-batch cupcake recipes. 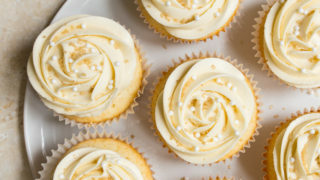 I believe you can search google for a full-batch wedding cupcake recipe, and I think Sally’s Baking Addiction just posted one. I could be wrong, though! Hi, I was wondering if I could substitute something for the almond extract? What?! That woman is living in Crazytown. I taught myself how to make wedding cakes specifically because I love eating them AND my friends weren’t getting married at a rate that would quench my need to eat said wedding cake. I mean, how DARE they, right? Now that I’m older and wiser I realize eating an 9″ multilayered cake by yourself is, perhaps, not the healthiest thing one can do for oneself. Do you think I could take this recipe and just bake it in a 6 inch cake pan instead of cupcakes? I did see your wedding cake (gorgeous by the way) but don’t want something that large. If you think that would work, would I need to adjust the temperature/bake time? Thanks for the help. Always! Hi Holly! So, my mom frequently doubles my cupcake recipes and makes them in a 6″ cake pan. I haven’t tried that with this recipe, so I’m not sure about baking time, but you could try checking at 20 minutes! These look perfect for my daughter’s upcoming birthday …21! Not sure how that happened? I do need to mail them to her. I’ll do my best with the shipping, but do you think they will be ok? Wasn’t sure if they need to be refrigerated? Thanks. Do you have a large recipe? I am making cupcakes for my daughters bridal shower and these look to be just what I want! I’m going to make the small batch to try today. Do you have a chocolate cupcake recipe? I had success making one batch of these when I first whipped the egg white alone, then added it to the creamed mix. The trial where I simply added the white then whipped it all, the cakes lofted nicely, then fell like a crater. Hi! This looks like a great recipe! If I wanted to use this recipe to make a 6 inch cake, would I need to double the quantities? I am planning on making these next week for my daughter’s daycare, only in mini muffin form. How long would you bake them in the mini muffin tins? Mini cupcakes work better for the little people lol! Thank you!!! I love your site, especially for the desserts. It’s so nice to have somewhere that has small batch recipes!! Is each cupcake 665 calories? No, I just updated for you! Sorry, my recipe calculator is wonky sometimes!